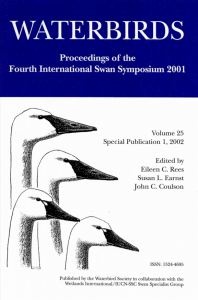 The proceedings of the Fourth International Symposium were published in Waterbirds, which is the scientific journal of the Waterbird Society. It has been the Society’s long-standing policy not to allow posting of PDFs on publicly available web pages because a large portion of its operating revenue now comes from electronic sources such as BioOne and JSTOR. However, the Society advise that PDFs of articles can be obtained from JSTOR via the hyperlinks below, or via. Swan SG members may also wish to become members of the Waterbird Society (www.waterbirds.org www.osnabirds.org/Apply.aspx), which permits access to all published content since 2002 on BIoOne (including other swan articles). Distribution and Population Estimates for Swans in the Siberian Arctic in the 1990s by Evgeny E. Syroechkovski, Jr. Effects of Grazing on Grasslands by Wintering Whooper Swans by Kendrew Colhoun and Keith R Day.